Upon introducing the Gypsy to several other Winos last fall, responses proved equally enthusiastic. Noah, in particular, became quite enamored, and he negotiated the purchase of a case of the stuff from his local TJ’s (which seemed to be the only retailer carrying the wine). Picking up a bottle or three became part of my bi-weekly grocery run. I’d drink a Gypsy every other night, at least, each glass tasting better than the last. And then, one horrible day, it was gone. Initially unconcerned, I asked the friendly sales staff when it might make its return. It’s not unusual for Trader Joe to find himself out of a particular bottle — you inquire at the help desk, and they usually say it’ll be in within the week. But this was different. This time it was completely sold out. People had been buying it by the case, they told me, and it was all gone. Wait till next year. A few days later, I spotted a rogue case of the Gypsy at the TJ’s in Sherman Oaks. I was short on cash, but I snagged as many bottles as I could afford, and I let Noah know about the surprise find; he apparently left work early to motor up the 405 and claim the remaining bottles. After that, however, it was really, truly gone. I’ve managed to save about eight bottles of the ’05 — they’re hidden in a secret location in my home, and only a handful of my closest friends know where they are (the lucky beneficiaries of my wine collection, I guess, should I happen to meet my untimely end on the way home from a Winos meeting one night). The characteristic that makes this wine so desirable to us is, to borrow a term from a series of regrettable beer commercials, its “drinkability.” Soft and plush, this delicate blend tenderly coats your mouth and invites you lose yourself in its chocolatey opulence. It’s not very nuanced, nor does it display any hints of its terroir; it’s just simply a pleasure to drink. We’ve tasted this kind of indulgently soft fruitiness on bottles costing $40 or $60 dollars, sometimes even as low as $20, but never any less than that. At the $5 level, it’s simply unparalleled — if velvety jam-bombs are your style, that is. According to chariotwines.com, the Gypsy is a blend of Cabernet Sauvignon, Petite Sirah, Zinfandel, and Sangiovese. I must admit, the inclusion Cab Sauv comes as a surprise to me. If you told me this was a blend of Petite, Zin and Sange — all varietals that tend to run jammy and decadent when grown in California’s warmer regions — I’d believe it, but there’s none of the tannin or earthy character that I’d expect from the inclusion of Cabernet Sauvignon. However, the $5 price bracket is not always one where “typicity” is prioritized. It’s more about finding a delicious bottle. Where the Gypsy is concerned, though, finding is the key word. The 2007 recently showed up at several regional Trader Joe’s outlets — but, like previous vintages, it’s flying off the shelves. If you do manage to find an ’07 at your local TJ’s, here’s what to expect when tasting it. First of all, it’s important to give this wine a little breathing room — straight out of the bottle, the 13.9% alcohol is very present, as it was on the ’05. Once it’s begun to open up, though, the nose starts to reveal a whole cacophony of scents: strawberry jam, cherry cordial, milk chocolate, copper coins. The palate is medium-bodied and jammy, with a layered complexity that really begins to show itself after some time in the glass. Big cherry notes are complimented by velvety swaths of cedar, pine cone, and cinnamon. The smooth finish serves up a healthy dose of white pepper, which lasts for a minute or more. And the longer you let it breathe, the tastier it gets. After an hour or so, all the flavors seem to just allow themselves to be folded into this chocolate cake batter essence, as if some pixie vintner had been surreptitiously whipping up a devil’s food cake in your glass. It’s really remarkable. Mind you, this wine isn’t for everyone. As enthusiastically as Noah and I might sing its praises, the Gypsy has its share of verdant detractors as well. “It’s too fruity,” complained Andrew, when I offered him a glass the other night. “It’s not unpleasant, but I don’t think I’d want to drink a whole bottle.” But it’s five dollars, I implored. C’mon. It’s an amazing wine for five dollars. “It’s good for five dollars, definitely,” he conceded. But some people would rather spend $12 or $15 dollars on a wine they find interesting, rather than just going for the cheapest thing that tastes generally good. Those who love the wine, however, truly love it — an affection which is probably only heightened by the difficulty one can expect to encounter when finding any. To that end, let this be a call to all Young Winos to be on the lookout for this bottle. If you see some quantity of it at your local Trader Joe’s, use the comment section below to alert other readers of its presence. Who knows how long it’ll be until the next vintage becomes available? We’ve got to get it while we can. Winos, unite. Guide your brethren to the bounty. And clear out a secret location in your home… this might be a wine you wind up hoarding. So I grabbed myself a case on Thursday at the Trader Joe’s in Burbank (on Alameda). They had a good quantity of it — at least five more cases, it seemed. Unfortunately, it was out in a big in-store display, so now you’ve got to contend not only with the true devotees, but also with the casual shoppers who buy anything that has a big sign above it. If anyone stops by the Burbank store, let us know how things are looking. I just picked up 3 bottles at the Encino store (White Oak and Burbank). The store seems to have a good supply. I did see a few people loading up their carts while I was there. So I don’t know how long their supply will last. That is so funny! I was just at a pool party over the weekend where someone brought it. She said she got it at Trader Joe’s for 4.99 so I didn’t expect much (I’m not a Trader Joe’s wine fan in general). But she told me a bit about the “Gypsy craze” so I tried it and really liked it! Lot’s of dark Cherry. I’ve been trying to invest in real estate this year but maybe I’ll just seek out some of this wine instead! HUGE stack of The Chariot at Trader Joe’s in Templeton…going fast. My experience with the ’05 was a classic tale of loss and redemption. After a game-night word to the wise from Jesse, I was lucky enough to procure two cases of the ’05 elixir from a patchwork of TJ’s from the Valley to Santa Monica. The euphoria was short lived, however, when I unwittingly cooked both cases by leaving them under an open window exposed to the California sun, albeit for only a short time. Luckily a few bottles had already been moved to a safe place, so all was not lost, but out of 24 bottles I had maybe 4 left. After calling every TJ’s in L.A. and eventually speaking to an inventory manager at a TJ’s warehouse, I was resigned to my 4 bottles. A few days later a call came in. We had ourselves a Broken Arrow; Jesse had spotted a rouge case in Sherman Oaks, and the race was on. Calls to the TJ’s wine counter were fruitless, and a trip up the 405 seemed the only option. Arriving at 9:05, 5 minutes after close, I thought the mission was lost; Not so. In a Navy Seal-like move, I slipped though the dormant sliding glass doors, past the security guard, and immediately blended into the patrons finishing up their evening shopping. The wine aisle came up empty, strike one, the stock room was barren, strike two. The wine counter was now my only hope. As I approached, the ceiling tiles parted and a thousand coruscating shafts of fluorescent light lit up a box of the floor with the name Gene scrolled on one side. Gene had apparently put a case on hold but failed to pick it up the previous day, and I was now the lucky beneficiary of Gene’s busy schedule. My apologies Gene, this stuff is delicious. It’s Fall 2013 and the Boston Red Sox have just won the World Series (for the 3rd time in 9 years), and Trader Joe’s has AGAIN stocked the wondrous [and CHEAP !] 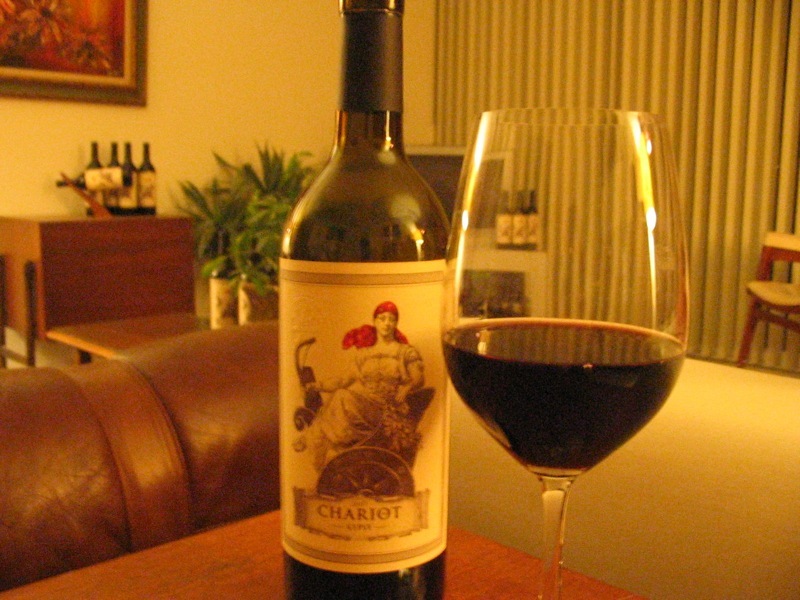 Chariot ‘Gypsy’ CA Red Wine . . . go get some while you can – it’s STILL offered @ $4.99 per bottle and is still as delightful as you can remember from previous vintages. I have been drinking Gypsy for several years now and stumbled upon it like so many others. I was on my way to a dinner party and looking for a good bottle of wine when my gaze fell upon the lovely Gypsy in the Red Scarf. Then I saw the price and said, “Well this is certainly worth a try!” Ever since then it is my wine of choice and it wins the ‘favorite’ vote at every dinner party we attend. It was quite a shock when I discovered it is ‘seasonal’ (as I was told at TJ’s), and I have yet to discover exactly what season they are talking about because it appears at different TJ’s in what seems to be at random times. Because of this I have begun hoarding it a bit and hanging on to the last bottle I have for a very special personal occasion between my husband and myself. If any person understands exactly ‘when’ is the season for Gypsy , please post it here so we can all benefit. Also, another note, I chanced upon another TJ’s wine called Pontificis (also a Red Table Wine – this cheeky nod to Châteauneuf-du-Pape is perfect. Made from the signature Côtes du Rhône GSM blend – Grenache, Syrah & Mourvèdre). And is only $5.99 per bottle and I have to say I liked it as well as Gyspy, BUT, I only purchased one bottle for a dinner party and when I went back to get more, it was sold out and I was told it was…guess what…SEASONAL! So now…during the ‘season’, whenever that my be, look for Gypsy and Pontificis…you won’t be disappointed.